A unique way of knowing the Delta — the silence of the kayak on the water. Morning and afternoon tours, among the trees, the water and the sky. A great way to get out of the city and take a breath. 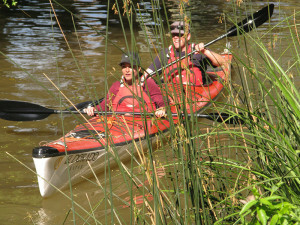 A whole day at the rithm of the river to enjoy paddling, walking, and relaxing. with the safeness of reliable equipment and experienced guides. Big groups, team building activities. 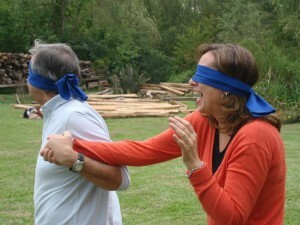 Tailor made outings to fit your demand, encourage team work communication and provide new experiences to your group. We love what we do! Join us and discover a unique place. Experienced guides, with many miles on the river behind. For nature lovers, the Paraná River Delta is the green shelter closest to the city. 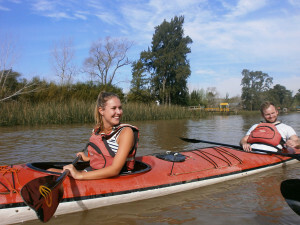 The port of Tigre is less than one hour away from Buenos Aires and is the most used to access the Delta. Life here has a different cadence—following the water and wind. Our outings in kayak and canoe give us the opportunity to enjoy it in all its splendor, in harmony with the surroundings. Do I have to be an experienced kayaker? How do I get to Tigre from Buenos Aires? Can I bring my camera? Is there somewhere I can leave my bag while we are paddling? No, our tours are thought for any level of experience and age. We give a basic kayak lesson before boarding the kayaks, because actually many of our customers go kayaking for the first time in their life with us. Yes. The most convinient are pocket cameras or cell phones. If it is not waterproof, bring it in a simple nylon bag to avoid splashes. DSLR cameras can be cumbersome aboard and more difficult to keep dry. You can bring it along in a dry bag if photography is a big deal to you. Yes, you can leave your belongings at our base on the island. We only cancel the tours in case of strong rain or thunderstorms. If you have a reservation and you don´t want to do the tour with ligh drizzle or unsettled weather, please contact us by phone to cancel your reservation. We take cash, bank transfers and deposits. If you want to pay in foreign currency, ask us about the exchange rate. We are not taking credit cards for the moment. It is best to make your reservation about a week in advance to ensure availability. If you want to do the tour within the next two days, please contact us both by phone and email, so we can get back to you ASAP and make the necessary arrangements. Safety is our priority. Our kayaks are strong and stable and we allways wear floating aids. Se trata de una salida fuera del circuito tradicional de remo y canotaje. Se recorren lugares espectaculares del delta, zona muy tranquila. los equipos son exlentes como sus guias. dominan el ingles a la perfecccion. 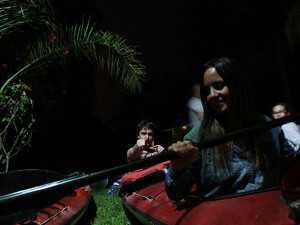 Tuvimos la oportunidad de hacer el recorrido en Kayak a la luz de la luna llena que nos acompaño todo el camino. Increíble. La atención, cuidado y explicaciones fueron buenas para la travesía. Al regresar nos estaban esperando con una abundante picada. Un gran día a los lugares más remotos afueras de Buenos Aires. Nos lo pasamos de maravilla remar con Juan y aprendiendo sobre las costumbres locales y la vida silvestre. If you want to know more about our tours, make a reservation or have any question, you can contact us by mail, phone or What’s App.